Emel Kitapci, the wife of Ali Kitapci, one of the victims from Saturday's bomb attacks, reacts as she stands with her son Artun Siyah Kitapci, 11, during a demonstration at the site of the explosions, in Ankara, Turkey, Oct. 12, 2015. The deadliest terror attack in Turkey’s history has left the country in shock, but appeals for unity are being ignored, poisoning Turkish politics just weeks ahead of elections that are unlikely to end a parliamentary deadlock. Within hours of the blasts that left at least 97 people dead and 246 injured Saturday in Ankara, Turkey’s politicians were trading ugly barbs. Kurdish separatists and a pro-Kurdish centrist party accuse the government of Recep Tayyip Erdoğan or the intelligence services of being behind the blasts that were likely carried out, according to an initial security assessment, by two male suicide bombers. Turkey's Prime Minister Ahmet Davutoglu said Monday the Islamic State group is the top suspect of investigators working to determine who was responsible for the bombing. But earlier, government politicians were claiming the Kurds themselves bombed the pro-Kurdish peace rally organized by labor and civil society groups, a sign of the ruling party's nervousness about the possible election impact of the bombing, analysts said. 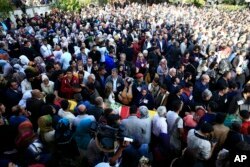 A bombing in the southeast mainly Kurdish town of Diyarbakır two days before the inconclusive June 7 parliamentary elections is believed by pollsters to have boosted the vote of the pro-Kurdish Peoples' Democratic Party (HDP), robbing Erdoğan's ruling AK Party of a legislative majority. People attend the funerals of victims on Saturday's bombing attacks, in Istanbul, Oct. 12, 2015. Despite his calls for calm and unity in the face of terror Prime Minister Ahmet Davutoğlu didn't heed his own advice to avoid the blame game until the facts are gathered and the perpetrators identified. He publicly speculated the outlawed Kurdistan Workers’ Party, or PKK, may have decided to engage in fratricide to stoke fears and sow chaos, although Monday he focused his suspicions more on Islamic State extremists. Some politicians from the ruling Development and Justice Party have even been more outspoken than Davutoğlu engaging in what Hurriyet newspaper columnist Nuray Mert dubs hate speech. “The president and his party feel free to accuse all kinds of opposition circles and people as ‘traitors’ who are the ‘domestic collaborators’ of all kinds of plots and conspiracies against Turkey,” Mert said. Adding to the breakdown in political dialogue across the parliamentary spectrum, leaders from the HDP and the Nationalist Movement Party (MHP) have refused to meet with Davutoğlu to discuss security developments. Just weeks ago the MHP looked like it might become a coalition partner with the ruling Development and Justice Party (AKP) and was holding talks with Davutoğlu following the indecisive June 7 elections. Police said the method of the attack and the kind of explosives in the twin blasts on Saturday outside Ankara’s main train station are similar to the deadly bombing in July in the southern Turkish town of Suruç in which dozens died. That attack on pro-Kurdish activists on the border with Syria was claimed by Islamic State extremists. Investigators are trying to identify the suicide bombers from Saturday's blasts by analyzing their body parts and by checking CCTV camera footage from the area before the explosions ripped apart bystanders and marchers. The Islamic State group issued a communique shortly after the blasts congratulating the bombers, although the terror group has not taken responsibility for Saturday’s terrorism. But the facts, even a definite identification of the bombers as Islamic militants or even tools of Syrian intelligence or revolutionary leftists, are unlikely to stop the blame game or encourage Turkey’s politicians to agree on a common stance against the terror striking the country. 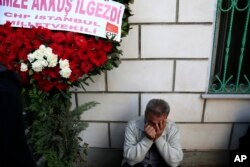 A man cries under a wreath during the funerals of victims on Saturday's bombing attacks, in Istanbul, Oct. 12, 2015. The intensity of the political enmity seemingly won’t allow that to happen. All parties are using the bombing to maneuver for the November 1 parliamentary elections, according to commentator İlnur Çevik. Opinion polls show the parliamentary elections in 20 days time are likely to produce a similar outcome to the June 7 elections, forcing the parties once again to negotiate over the formation of a coalition government. And with the intensity of the political hatred being witnessed now, coalition talks are likely to be even more difficult than they were in the summer, fear analysts.